Introducing the next generation of till system. Swoopos is the comprehensive mobile point-of-sale system that combines the latest ePOS and cloud-based technology to deliver fast data and reporting results for your business. Empower your staff and run your front of house with ease. The easy to use interface will have them processing transactions, booking tables, splitting bills and closing out tabs in no time. Providing a top level reporting system, the Swoopos back office covers everything from revenue, stock control, inventory management, staff performance, customer data and more. Plus, using the latest in cloud-based technology, you can stay up-to-date from anywhere in the world. Keep up with consumer demand with the fully integrated mobile ordering app SWOOPE. Open yourself up to a whole new demographic and watch the orders roll in from your time sensitive customers. Also provides a way to offer deals and reward loyalty. Tailored plans are available to suit all budgets. 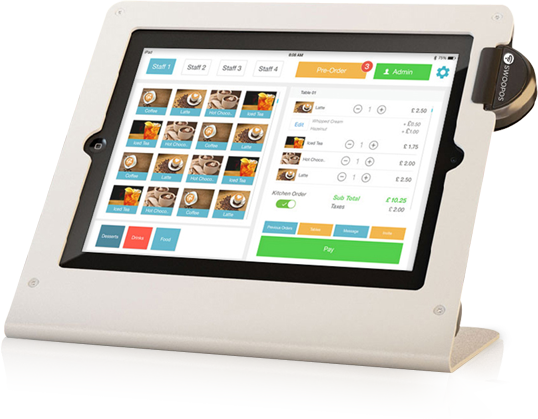 Creating a seamless customer experience, Swoopos integrates a mobile ordering app with your instore POS system. Use it to receive mobile orders for eat in and take away and reward customer loyalty. Beacon technology enables you to promote deals and products direct to your target customers. The built-in booking system will send an automatic booking confirmation SMS straight to your customers, as well as build a profile by recording spend, buying habits, and loyalty level. All this combines to enable staff to deliver a more tailored experience to them. Can also be used to hold items, secure a deposit and collect at a later date. At the touch of a button, staff can split the bills based on the individual items with ease, and let the customers pay by their preferred method. Access your daily operating data anywhere, anytime. View point of sale operations, customer data, inventory, staff performance and more with just a few clicks. Create reports and analytics from your venue, or compare multiple locations with ease.